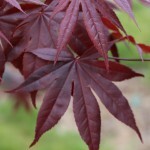 A vigorous, upright tree that holds deep red-burgundy leaves in either sun or partial shade. The foliage is darker red than 'Bloodgood'. Leaves emerge about two weeks later than most Japanese Maples. This reduces the risk of damage from late spring frosts. Fall color is a crimson red. Prefers full sun, moist, well-drained soils and some protection from the hottest summer sun. Discovered in Pennsylvania.